now, I wonder how Media Market will go in Shanghai . Funny because in New York at least, Best Buy is known for being very competitive with prices but saddled with appalling service. I normally buy from Newegg and 360buy. Yeah, i hate to worry about buying fake and bargaining. Their price is low too and you don’t need to lug the stuff home. I believe Media Market will be next. I had such bad experiences with BB. I bought so much stuff there and bought the warranty and they never fixed it properly and made excuses! It was a mess! Their service suckkkk! Media Mart on the other hand is a different story. I had a problem with one device I had and they exchanged it even without the warranty. So I am not sad to see them go! Come on, Suning and Gome are not that bad. As two of the largest home appliances chain stores in China, they’ve got to give their customers some assurance on quality. I’ve shopped at Suning a few times and I think the low prices they offered are worth you bearing their lousy service. Also, when you think of the wages these poor shopping assistants earn, you will become more understanding of them. Do you think that this “pulling out” (at what appeared, to me at least, to be very short notice; leaving people unemployed and consumers stuck with next-to-useless warranties and guarantees etc) will leave a smudge on large American retail stores in the minds of the general populace? I mean.. how much trust can the general populace place on another large American department store chain should it choose to setup shop in Shanghai?.. 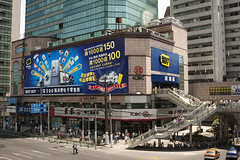 The press reported a couple months ago about Best Buy’s lack of acceptance in China. The reason given was the Chinese consumer’s shopping habits, they like to make their own choices rather than be given a curated selection. Anyone who has been to a typical Chinese shopping market would understand this. Related, does Best Buy CN allow haggling and discount, bargaining that a typical Chinese shopper would expect? Further, does Best Buy CN have the typical 15-30 or 45 day return exchange policy? This typical Western feature of retail shopping is something that causes a lot of headache and economic woes for Western retailers. Most shopping centers have their return desks at the entrance since the lines for returns/exchanges are larger than the lines for buying. The one nice feature of buying from such an establishment is the smaller chances of buying fakes. The cons are plenty, but when it comes to consumption from retailers, the more selection, the better for the consumer.